The curriculum of our girls recreational program is designed based upon USA Gymnastics Junior Olympic levels. We have created a unique developmental program to help each child build confidence as they master each progression and skill. Girls ages 5 and up will learn basic skills on each event and advance to the next level when the instructor feels they have mastered the skills necessary to do so. Each class will bring the child to 3 events. Floor is worked on each week, and we will alternate the other events doing Vault and Bars one week, and Beam and Trampoline the other. Please speak with a staff member to determine what level would be appropriate for your child, we do offer a FREE trial class to help evaluate your daughter's abilities. We place our students in classes with their appropriate age and ability to help your child gain confidence as they learn new skills. For children with little or no experience in gymnastics. 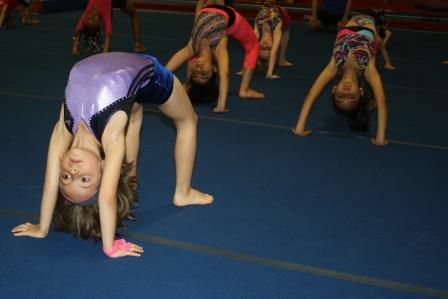 Your child will be introduced to the basic skills and positions on each event and learn the rules of safety in gymnastics. For gymnasts who have completed all Red level skills, such as a handstand and cartwheel and is familiar with basic skills on the other apparatus. For gymnasts who have completed the White level - students should have a strong roundoff and back bend kickover on the floor before advancing to this level. Students may enroll in these classes by invitation only. 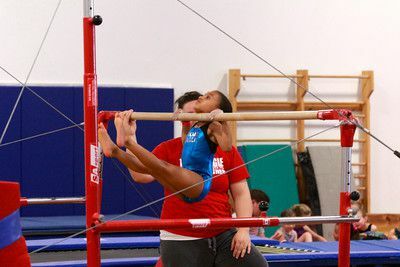 Gymnasts must have completed the blue level skills before advancing as these classes have increased levels of difficulty which require a good knowledge and mastery of basic skills on each event. Due to the increased difficulty, it is highly recommended that students at this level attend more than one class/week to help master the skills in each level.